Penguin Update 2016: Game Changer or a Damp Squib? The SEO universe is rife with speculation about the imminent arrival of the latest Penguin Update. It is perhaps the most awaited algorithm update in Google’s history. To all those unenlightened greenhorns who are completely oblivious to Google Penguin update, let’s first begin by taking a bird eye’s view of its evolution and what on earth it is all about? Penguin refers to a set of algorithm updates that are released on time-to-time basis by the Google, the search engine behemoth, to raise the value of search query results for its users. It was first released on 24th April 2012. Penguin Update seeks to bring to task scheming companies and web developers, those who deploy malicious tactics such as Black Hat SEO techniques to artificially boost the search engine rankings of their websites and web pages. Black Hat SEO techniques often include link spamming, keyword stuffing, using invisible text on web pages, reproducing copyrighted content from genuine websites to further the ranking of their websites. I hope you are not visualizing the ultimate farcical duel between the feeble Arctic creature and the endangered Chinese bear. Pun intended! Well, Google Panda is a search engine filter, first rolled out in February 2011, which precisely targets poor quality or “thin” websites by depreciating them in search engine results so that legitimate and authentic websites can attain more prominent rankings while it’s another Google contemporary, Penguin vows to truncate the rankings of websites that tamper with the guidelines of Google Webmaster. While it is possible that Panda affects an entire website; Penguin usually affects only one part of a site on a keyword or page level. A website that has been purged by the Penguin is usually unable to resume until either an update or a refresh happens. Penguin and Panda work in tandem in the sense that both attempt to deliver high quality and superior content websites on top of the search engine results. The last Penguin Update i.e. Penguin 6 was rolled out on October 17th, 2014 and it affected around 1% of queries. 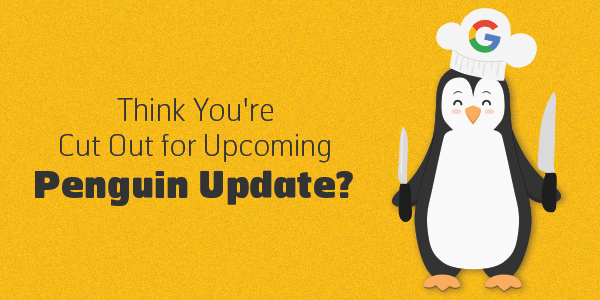 With the news of upcoming outing of Penguin doing rounds, the SEO world was initially opinionated on whether it will be an update or just a refresh (rerun) of the existing update. Those rumours were put to rest on 24th November 2015 by a recent tweet from Gary Illyes of Google who confirmed that the latest outing will indeed be a full-fledged update. With Penguin 2016 destined to be a full-fledged update there is high possibility that all those sites that weren't hit earlier could end up tripping this time around. Also, Penguin Update is widely anticipated to be a real time version. If the rumours are true, then that may lead to major upheavals. Since previous Google updates used to be so infrequent, it was not uncommon for websites to wait for a year or so to reap the benefits of a link clean up. With Real time version becoming a reality, all that seems to be a thing of the past. Real time version basically translates to this – as soon as Google encounter spammy links, websites will be struck immediately and the moment spammy links are done away with, the sites may witness a prompt recovery. 1. Fine tune the content sent to search engines; and try to make your pages appropriate for the keywords you submit. 2. You can deploy Disavow Link tool that assists websites to get rid of spam. 3. Look for any type of vicious content that is being promoted on your website. 4. You can also use Webmaster tool that evaluates your site’s SEO and keeps you in the loop regarding all the problems your site can get into, if any. 5. Avoid any kind of Black Hat SEO techniques such as keyword stuffing and cloaking. 6. Make your site compatible with social networking sites such as Facebook and Google+. 1. Become Social- Conceive and disburse descriptive content via social networks. 2. Social Advertising- Connect with your audience on Facebook or Myspace. 3. Guest blogging- Generating original content for external websites. 4. Mix it Up- Build up varied content such as using video, images, presentations and so on.